Volcanic’s drilling at the Mandiana Project, Guinea, intersects broad mineralized intervals including 68m @ 2.01 g/t Au, delineates significantly expanded mineralized target area | Volcanic Gold Mines Inc.
July 13, 2017 - Vancouver, British Columbia - Volcanic Gold Mines Inc. (“Volcanic”) (TSXV: VG) is pleased to report initial results of its exploration drilling campaign at its Mandiana Projects in Guinea. To date, a total of almost 3,000m of reverse-circulation (“RC”) and diamond drilling, and over 15,000m of air-core drilling, have been completed at Mandiana and at lands recently optioned from West African Mining Associates SARL (“WAMA”). The program to date results in the expansion of the strike potential of the Yagbelen Resource at Mandiana by approximately 1,000m, and its lateral potential by up to 500m. The program has also demonstrated the efficacy of air-core drilling as an exploration and target definition technique. Results are reported for the initial holes of this program. Air-core drilling has been successfully deployed in the identification of extensions to the north, east and south of the Yagbelen Resource, in which regard it has defined a further 1,000m of strike potential. 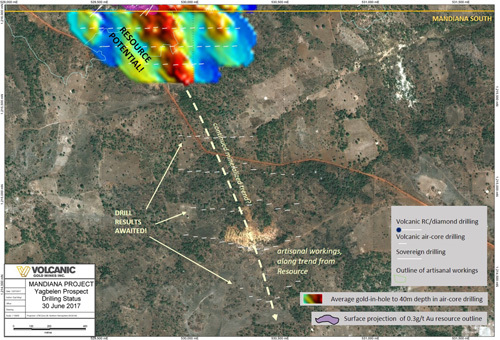 As may be seen from Figure 1 below, initial air-core results clearly illustrate the strike continuation of a strongly anomalous gold mineralization (colored red and yellow) extending approximately 500m to both the north and south of the Resource (colored in magenta), as well as laterally, 500m to its east. 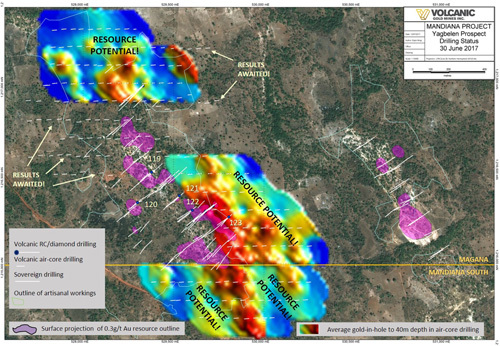 These results clearly demonstrate the efficacy of air core drilling in the Mandiana district, and on this basis, Volcanic has defined a very significant near-term resource drilling target. Results of air-core drilling from a southward 1,250m strike extension (see Figure 2 below, which represents the area immediately to the south of that shown in Figure 1) to the reported grid, as well as an infill block covering approximately 500m of strike (see Figure 1) remain outstanding. Air-core drilling has been performed in grid-like fashion on a series of “fences” established at 100-200m intervals, along which inclined holes have been drilled at 40-50m spacings. This rapid, low-cost approach to exploration has been designed to provide detailed and accurate information on near-term resource targets. The air-core drilling is ongoing. Reverse-circulation and air-core drilling of the Farabakoura deposit at the WAMA Project has also been completed, its purpose being to confirm the high grade historic results announced by Volcanic on April 18, 2017, below, and to define zones of extension to this mineralization. Results of drilling are anticipated and will be reported shortly. Drill chip sampling at Mandiana followed a standardized protocol to ensure the collection of representative and unbiased quantities of material from each sample. Samples were collected from Volcanic’s Mandiana field operations by SGS Mineral Services of Bamako, Mali, and were transported directly to the assay facilities thereof, at which they were analysed for gold by means of fire assay, in accordance with analytical method FAA505. In this procedure, a 50g sample is fused with a litharge based flux; the resulting prill is then dissolved in aqua regia, from which gold content is then determined by flame AAS at a detection Limit 0.01 ppm. Volcanic routinely inserted appropriate standards and blanks into its sample stream at Mandiana, and additionally collected regular field duplicate samples. In January 2017, Volcanic acquired an indirect 75% interest a Guinean entity, Guiord SA, which owns 100% of the Mandiana Project in Guinea. The remaining 25% interest in the Mandiana Project is held by SOGUIPAMI, a Guinean government-owned business entity formed to conduct mineral exploration projects. In April 2017, Volcanic entered into a binding letter agreement to acquire 80% of WAMA, a private Guinean company, the landholdings of which together adjoin the entire length of the southern boundary of, and lie within the same mineralized trends as Volcanic’s Mandiana Project. The Mandiana and WAMA Projects are underlain by geology comparable to that of many other Birimian-age volcano-sedimentary sequences in West Africa, in which gold mineralization typically exhibits a strong relationship with major structural and hydrothermal zones. At both the Mandiana and WAMA Projects the gold mineralization associates with a network of quartz veins which appear to relate to such zones, and is located at major lithological and structural breaks. In the near vicinity and of very similar geological character is AngloGold Ashanti’s Siguiri Gold Mine (Measured and Indicated Resources of 3.37 Moz Au and Inferred Resources of 2.14 Moz Au). Other significant gold deposits and mines in the neighboring area include Hummingbird Resources’ Yanfolila project, Avnel’s Kalana property, and Avocent’s Tri-K project. Of key importance at the Mandiana and WAMA Projects is the presence of shallow but extensive artisanal workings in the project area, which are seen to follow the north-south mineralized trend common in known deposits in the vicinity. Limited drilling beneath such working by both Sovereign and WAMA in their respective properties led to the identification of bedrock gold mineralization. Many kilometers of artisanal workings on these trends remain to be drill tested. Certain statements contained in this news release constitute forward-looking statements within the meaning of Canadian securities legislation. All statements included herein, other than statements of historical fact, are forward-looking statements and include, without limitation, statements about the Company’s exploration plans for the Mandiana and WAMA Projects. Often, but not always, these forward looking statements can be identified by the use of words such as “estimate”, “estimates”, “estimated”, “potential”, “open”, “future”, “assumed”, “projected”, “used”, “detailed”, “has been”, “gain”, “upgraded”, “offset”, “limited”, “contained”, “reflecting”, “containing”, “remaining”, “to be”, “periodically”, or statements that events, “could” or “should” occur or be achieved and similar expressions, including negative variations. Forward-looking statements involve known and unknown risks, uncertainties and other factors which may cause the actual results, performance or achievements of the Company to be materially different from any results, performance or achievements expressed or implied by forward-looking statements. Such uncertainties and factors include, among others, whether the Company’s exploration work on the Mandiana and WAMA Projects will proceed as intended; changes in general economic conditions and financial markets; the Company or any joint venture partner not having the financial ability to meet its exploration and development goals; risks associated with the results of exploration and development activities, estimation of mineral resources and the geology, grade and continuity of mineral deposits; unanticipated costs and expenses; and such other risks detailed from time to time in the Company’s quarterly and annual filings with securities regulators and available under the Company’s profile on SEDAR at www.sedar.com. Although the Company has attempted to identify important factors that could cause actual actions, events or results to differ materially from those described in forward-looking statements, there may be other factors that cause actions, events or results to differ from those anticipated, estimated or intended. Forward-looking statements contained herein are based on the assumptions, beliefs, expectations and opinions of management, including but not limited to: that the Company’s exploration work on the Mandiana and WAMA Projects will proceed as intended; that the Company’s stated goals and planned exploration and development activities will be achieved; that there will be no material adverse change affecting the Company or its properties; and such other assumptions as set out herein. Forward-looking statements are made as of the date hereof and the Company disclaims any obligation to update any forward-looking statements, whether as a result of new information, future events or results or otherwise, except as required by law. There can be no assurance that forward-looking statements will prove to be accurate, as actual results and future events could differ materially from those anticipated in such statements. Accordingly, investors should not place undue reliance on forward-looking statements. the Yagbelen deposit. Existing Resource is shown in magenta. results (results pending) at Mandiana South.